666 might be a bad number for some but definitely not for this promo from AirAsia. The largest low-cost airline in Asia offers as low as 666 Pesos base fare on some of their domestic routes. The travel period is from May 1 to November 21, 2018. The booking period is from October 23 to 29, 2017. Tickets can be booked online at www.airasia.com or at any AirAsia ticketing office. Why Travel from May 1 to November 21, 2018? One reason to travel is on that period, there are several non-working holidays you can take advantage of as an opportunity to rest and spend time with family or friends. Here are some of them. *Eid'l Fitr and Eid'l Adha, are Muslim holidays that typically fall between the months of June and November so you can add this to your consideration. There are also local holidays exclusive to a city or province which you may consider when planning a vacation. 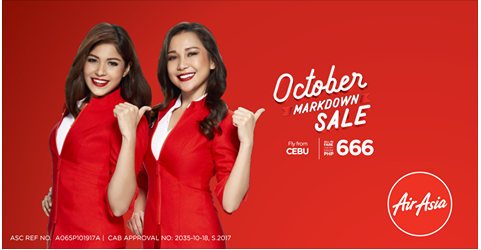 A Few Reminders Regarding the "666"
Unlike Cebu Pacific and Philippine Airlines, AirAsia only posts the base fare. So please take note that the 666 Pesos here is just the base fare and does not include taxes and other fees imposed by the government. When flying from Manila or Cebu, terminal fee will also be included in your ticket's final price. Keeping this in mind will help avoid unwelcome surprises. Before you invite friends to a trip, I would advise that you make a trial booking to see the final price. Then after you saw how much it would really cost, then you can decide whether to proceed or wait for a more attractive offer. Anyway, AirAsia offers several promos in a month with different price points. And besides, you also have other choices for domestic travel namely, Cebu Pacific and Philippine Airlines. Both of these offers promo fares from time-to-time.